Proponents of higher taxes are fond of claiming that Bill Clinton’s 1993 tax increase was a big success because of budget surpluses that began in 1998. That’s certainly a plausible hypothesis, and I’m already on record arguing that Clinton’s economic record was much better than Bush’s performance. But this specific assertion it is not supported by the data. In February of 1995, 18 months after the tax increase was signed into law, President Clinton’s Office of Management and Budget issued projections of deficits for the next five years if existing policy was maintained (a “baseline” forecast). As the chart illustrates, OMB estimated that future deficits would be about $200 billion and would slightly increase over the five-year period. In other words, even the Clinton Administration, which presumably had a big incentive to claim that the tax increase would be successful, admitted 18 months after the law was approved that there was no expectation of a budget surplus. For what it’s worth, the Congressional Budget Office forecast, issued about the same time, showed very similar numbers. 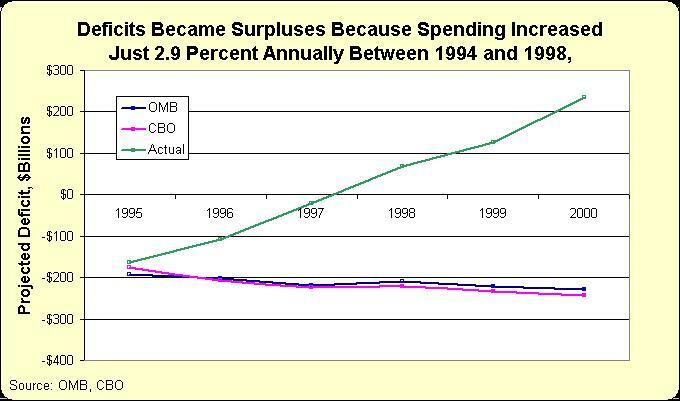 Since the Clinton Administration’s own numbers reveal that the 1993 tax increase was a failure, we have to find a different reason to explain why the budget shifted to surplus in the late 1990s. Fortunately, there’s no need for an exhaustive investigation. The Historical Tables on OMB’s website reveal that good budget numbers were the result of genuine fiscal restraint. Total government spending increased by an average of just 2.9 percent over a four-year period in the mid-1990s. This is the reason why projections of $200 billion-plus deficits turned into the reality of big budget surpluses. Republicans say the credit belongs to the GOP Congress that took charge in early 1995. Democrats say it was because of Bill Clinton. But all that really matters is that the burden of federal spending grew very slowly. Not only was there spending restraint, but Congress and the White House agreed on a fairly substantial tax cut in 1997. To sum things up, it turns out that spending restraint and lower taxes are a recipe for good fiscal policy. 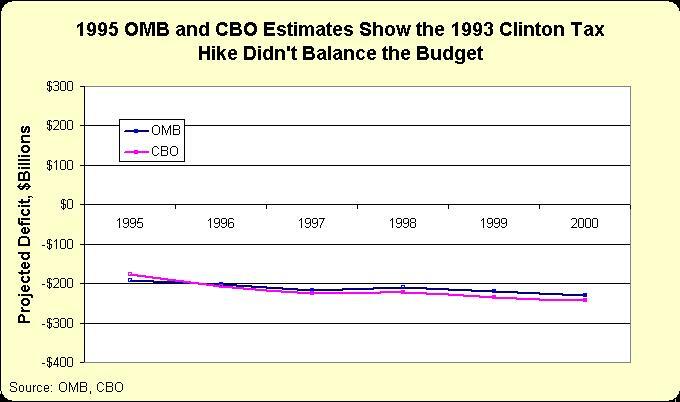 This second chart modifies the first chart, showing actual deficits under this small-government approach compared to the OMB and CBO forecasts of what would have happened under Clinton’s tax-and-spend baseline. One of the most objectionable things about current opinion is the concept of our king president and his subordinate houses of Congress. The House of Representatives matter. And in matters of the pocket book they matter very much, as President Reagan experienced in his terms. A president can marshal public opinion and get his way, as Reagan did on his historic tax cuts, but Mr. Tip O’Neil proved that a president’s budgets can be “dead on arrival” if the House so desires. The surpluses of President Clinton’s term belong to Mr. Gingrich and the deficits attributed to President Reagan belong to Mr. Tip O’Neil. nothing to do with it! Then, satellte communication matured leading to cell phone popularity. Again, Clinton had nothing to do with this. He’s just lucky o be in office at the time! Tell the truth! I believe that capital gains taxes were cut and subsequent capital gains revenues responded almost immediately. Posting these may help too to show the breakout of tax revenues by type of tax. The other two things are that defense spending declined and the dot com bubble generated lots of business activity for which both business and personal income taxes increased. It would be nice if you or others put up clear charts illustrating these two effects.